ABOVE: Foundation walls line an empty moat beneath the Louvre Museum. The Louvre Museum has been a "Grand Gallery" since 1793. But long before it became a public museum, the Louvre was a fortress dating back to the reign of Philippe Auguste, the French king who paved the streets and built the walls of Paris. 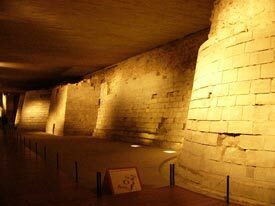 Thanks to archaeological excavations in the mid-1980s, a "Medieval Louvre" exhibition beneath the Louvre Museum's Coeur Carré courtyard now lets visitors explore the ruins of the castle that existed from 1190 AD until the early 16th Century, when the keep was torn down to make way for the Renaissance palace that survives as the Musée du Louvre.